Born out of a passion to assist those who struggle with literacy, LTR Tutoring Associates was founded in 2004. Today, in addition to providing instruction to struggling readers, we have broadened our mission to include literacy and dyslexia awareness through community service. We are experienced, trained, and certified instructors and trainers in a number of research-based multisensory literacy programs, including the Wilson Reading System®, LANGUAGE! and Project Read strands. These programs fulfill the recommendations published by the National Reading Panel and the National Institute of Child Health and Human Development’s (NICHD) research and findings. Cheri McManus, Ed.D. is certified by Wilson Language Training®. She has educated children with learning, physical and emotional disabilities in both the public and private sector for more than 25 years. In 1998, Cheri pursued certification in the Wilson Reading System®. Upon completion, she worked at St. Joseph Hospital in Nashua, NH for the Office of Neuropsychology, Learning and Behavioral Medicine. There, she worked to assist in the treatment of clients with dyslexia. Returning to a public school setting, Cheri implemented programming designed to provide direct instruction to dyslexic middle school students with a goal of reducing the dropout rate for that population. Cheri has trained hundreds of teachers in all of the Wilson® programs, including Fundations®, Just Words® and the Wilson Reading System®. She has worked with dozens of school systems as a trainer, both in the US and abroad. It is her hope that through her work with teachers that she can positively impact even more struggling readers. Cheri currently continues to provide direct instruction to elementary and middle school students struggling with literacy, and has been an adjunct professor at both Rivier University, in Nashua, NH and Fitchburg State University, in Fitchburg, MA. Cheri served as the student teaching supervisor and instructor for the Graduate School’s Reading Masters Program at Rivier University. Cheri retains membership in the Learning Disabilities Association and the International Dyslexia Association (IDA). She recently earned the degree of Doctorate of Education (Ed.D.) from New England College, in Henniker, NH. She is a former Board Member of the NH Branch of IDA, and Board of Governors, for the 32 Masonic Learning Center in Nashua, NH. Dianne Melim, M.A. has worked in the field of education since 1980. She has a B.S. in Elementary Education and a M.A. in Counseling Psychology. She is NH state certified as an Experienced Educator and General Special Educator and was licensed as a Clinical Mental Health Counselor. She is also a Wilson® Dyslexia Therapist certified by the International Dyslexia Association, along with being a certified Wilson® Dyslexia Trainer. Dianne is a certified Level I and Level II Wilson Reading System® Instructor, Fundations® and JUST WORDS® Presenter, Fundations® and Just Words® Facilitator and Level I Wilson® Trainer. Dianne has provided reading instruction to students of all ages including primary, elementary, middle school, high school and adults, and has trained dozens of teachers. She has worked in public and private settings as a tutor, Special Education teacher, case manager, and multi-sensory reading teacher. She currently serves as a Special Education reading teacher for a public school district in addition to private practice. Dianne also has many years of experience as a psychometrist, evaluator, and therapist in both inpatient and outpatient settings, and has worked for Northeast Psychiatric Associates, Brookside Hospital and St. Joseph’s Hospital in Nashua for the Office of Neuropsychology, Learning and Behavioral Medicine. Dianne is a member of the Learning Disabilities Association and the International Dyslexia Association. She also served on the Board of Governors for the Masonic Learning Center for Children in Nashua, NH. Our tutors maintain the highest levels of integrity, ethics and professionalism, including protecting and respecting client confidentiality. Robin Carlo has worked in the field of language based learning disabilities for over 30 years. She has extensive experience with direct student instruction and supporting the professional development of teachers. Robin was the first teacher trained in the Wilson Reading System® and has worked for Wilson Language Training as a consultant, professional development provider, tutor, and program developer since 1988. She has utilized the Wilson Reading program, Just Words®, and Fundations® programs in group and tutorial settings. She is also trained in Orton-Gillingham, and in Project Read’s Phonology, Framing Your Thoughts and Story Form programs. She earned her B.S. and M.Ed. in Special Education at Fitchburg State College and received her certification as a Reading Specialist through the Reading Institute in Williamstown, MA. Evelyn holds a BS degree in Elementary Education. She received her National Board Certification as an Early Childhood Generalist in 2002 and earned her recertification in 2012. 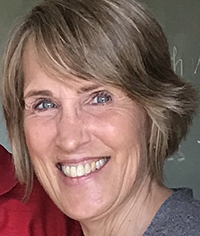 Evelyn worked in the Arlington Public School System in MA for 28 years as a classroom teacher, reading coach, Wilson® Credentialed Trainer, in-district for Arlington Public Schools, and coordinator of English Language Arts for grades K-5. Evelyn attended the Coaches Institute and the Reading and Writing Institute at Columbia University. She is a Wilson® Credentialed Trainer for Wilson Reading System® Level I and Level II and a Wilson Credentialed Presenter for Fundations® – Levels K, 1, 2 and 3, and a Wilson® Dyslexia Therapist. Kelli Killion has worked in education for over 25 years and is currently working as a K-8 literacy coach in SAU 24 which serves the towns of Weare, Henniker and Stoddard. She received her B.S. degree in Early Childhood and Elementary Education at Stonehill College. In 2014, she received her Masters of Education in Curriculum and Instruction from Plymouth State University. In New Hampshire she is certified as a Pre-K–8th grade teacher and as a K-12 reading and writing specialist. Kelli has worked as a teacher in Pre-K through four classrooms for 18 years and as an elementary reading specialist for four years. Kelli is Wilson Reading System® Level I and Level II certified at the Wilson® Dyslexia Therapist level and is Wilson® credentialed as a Fundations® presenter. Kelli is also a certified trainer for the Keys to Comprehension program through Keys to Literacy. This year she has also been teaching a class at New England College called Professional Practices and School Law. Sarah has been working as a special educator for the last 10 years in NH and for the last 4 years in a Concord area school district as a middle school case manager. She holds a dual certification in General Special Education and Learning Disabilities. She has an undergraduate degree from University of Maine at Farmington and her master’s degree from UNH. Sarah is Wilson Reading System® Level I certified at the Wilson® Practitioner level and has experience with a wide variety of reading and math intervention programs. Rhoda has taught elementary and middle school students in Connecticut, Maryland, New Hampshire, and Texas. Rhoda is certified as a Wilson® Credentialed Trainer and Wilson® Dyslexia Therapist. She has conducted trainings from Montana to Texas to New England in the Wilson Reading System®, Fundations® and Just Words®. Rhoda is a graduate of Bates College and has a Master’s degree in Special Education from the University of Texas at Austin. Judy Storer began her teaching career in 1971 at a progressive, non-graded elementary school in Portland, Maine. In 1983 her focus switched from elementary education to adult education and she became certified in reading instructing high school dropouts and adults both native and nonnative as as adult educator for Portland Adult Education. From 1990 to her retirement she taught reading, writing, and spelling to language disabled students and English language learners one on one, and in groups. She incorporated multisensory structured language strategies and techniques using the Wilson Reading System® into her reading curriculum and developed courses for non-native speakers based on structured language and phonology. In 1998, after four years of intensive training and course work, Judy became a Wilson® Credentialed Trainer for Portland Public Schools and trained teachers, tutors, and educational technicians. She also began presenting WRS workshops both locally and nationally. Upon her retirement from Portland Public Schools in 2009 Judy began working as a Literacy Specialist for Wilson® Language Training. She is a Wilson® Credentialed Trainer and a Wilson® Dyslexia Therapist. Currently Judy presents all Wilson® workshops nationally, coaches Fundations® teachers and Just Words® teachers, certifies facilitators and Level 1 teachers in the Wilson Reading System®. 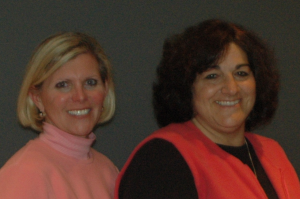 LTR founders Cheri McManus and Dianne Melim.